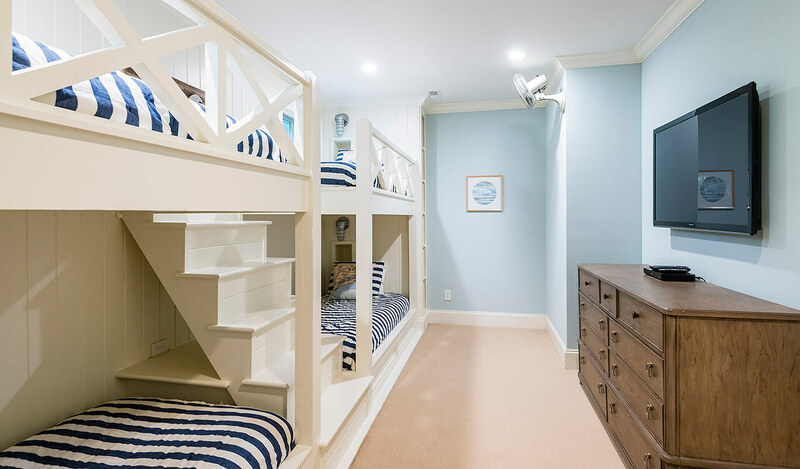 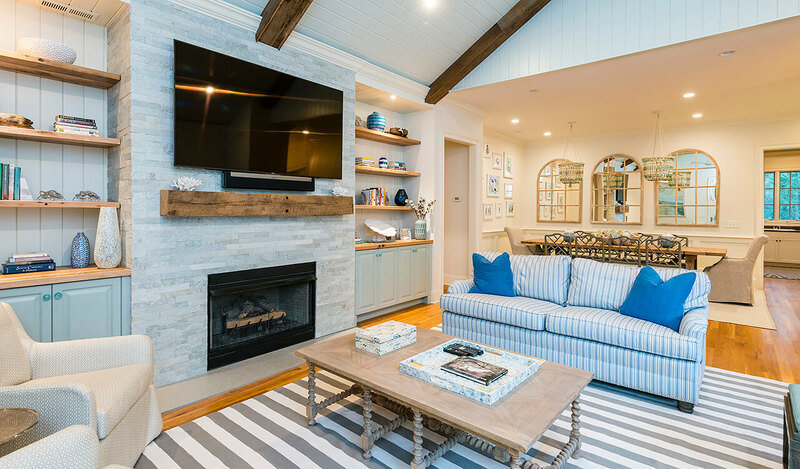 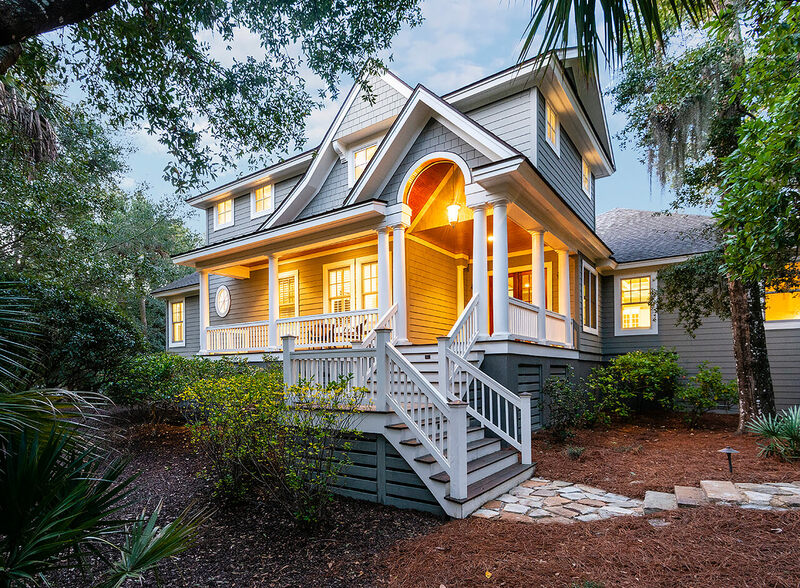 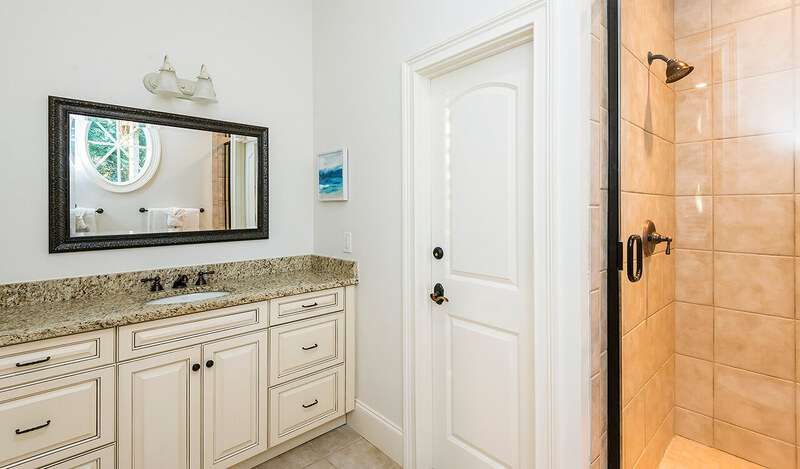 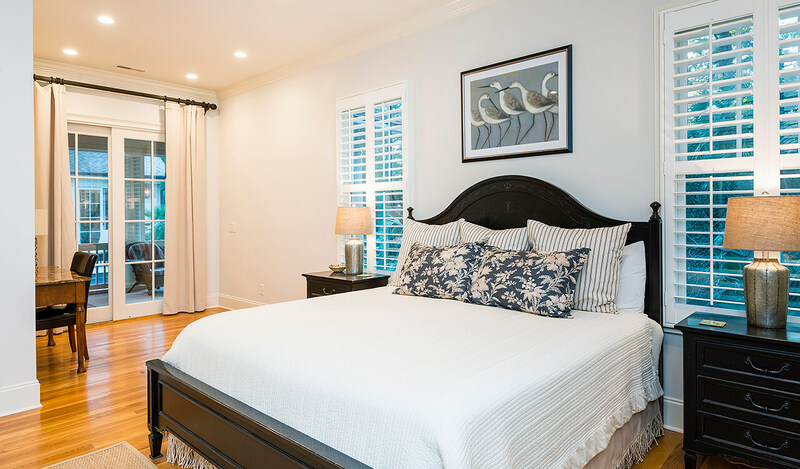 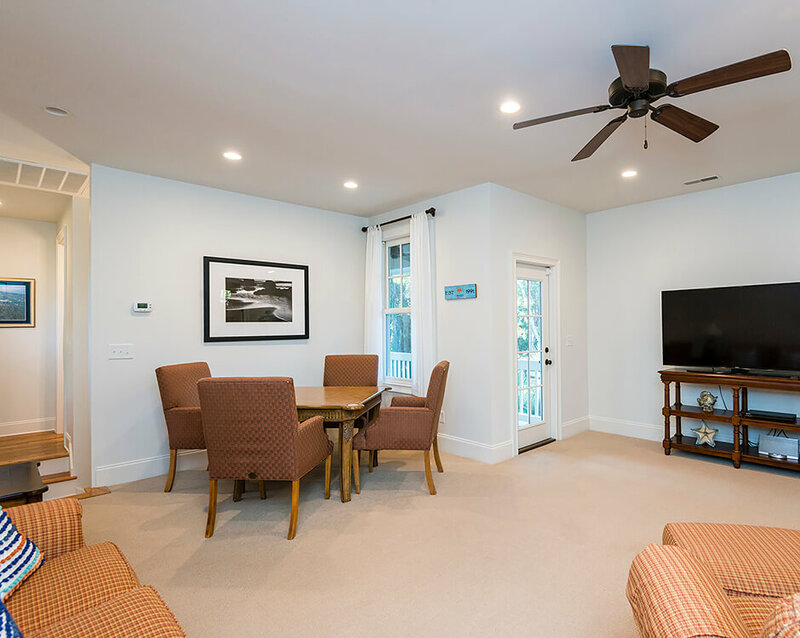 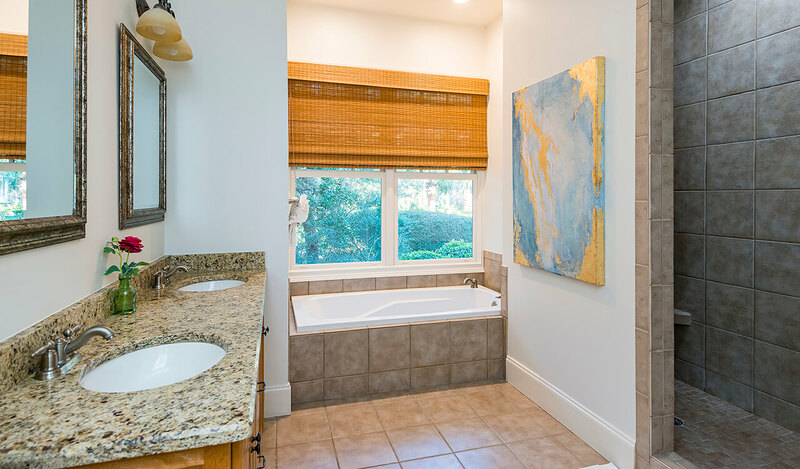 The multi-generational coastal home at 147 Hooded Merganser Court offers a rare opportunity for a family desiring a private vacation home and just a three-minute bicycle ride from boardwalk no. 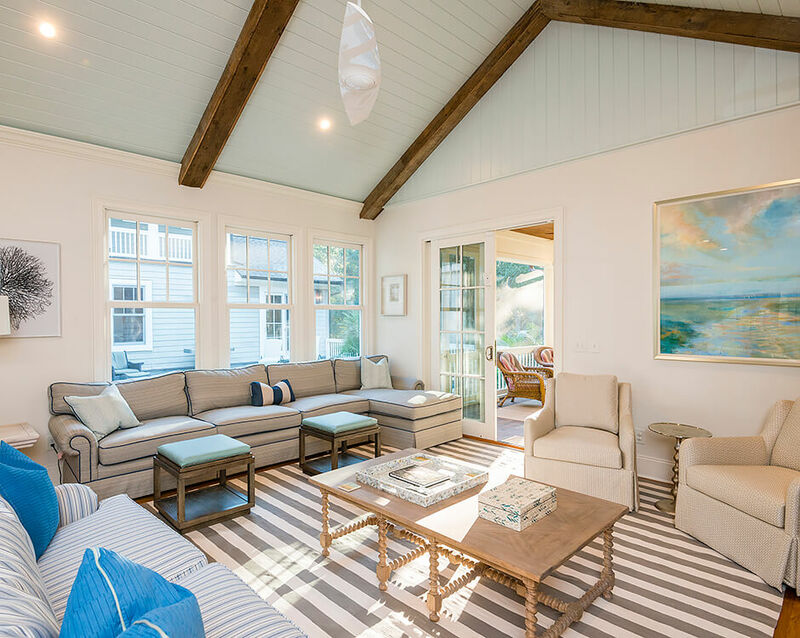 32 on Kiawah’s pristine beach. 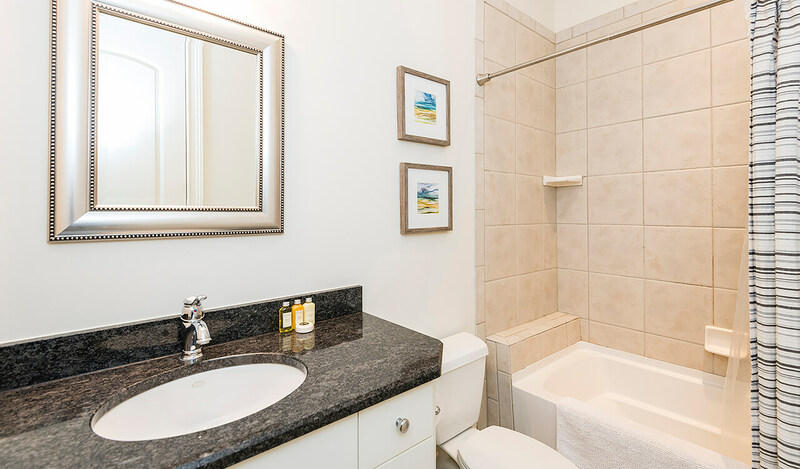 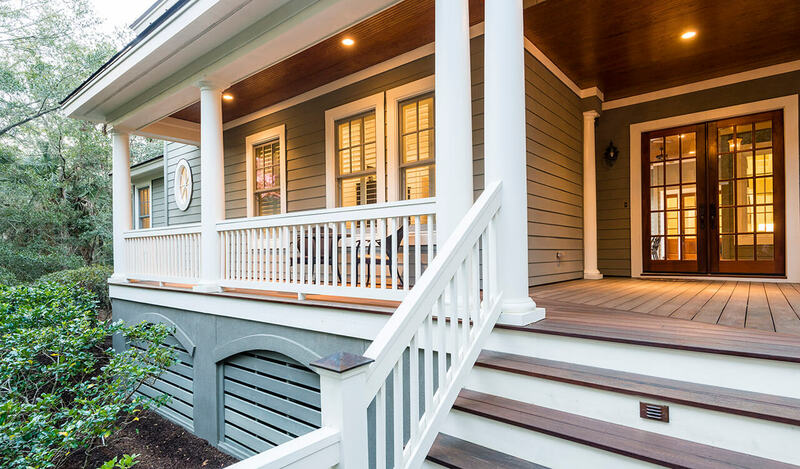 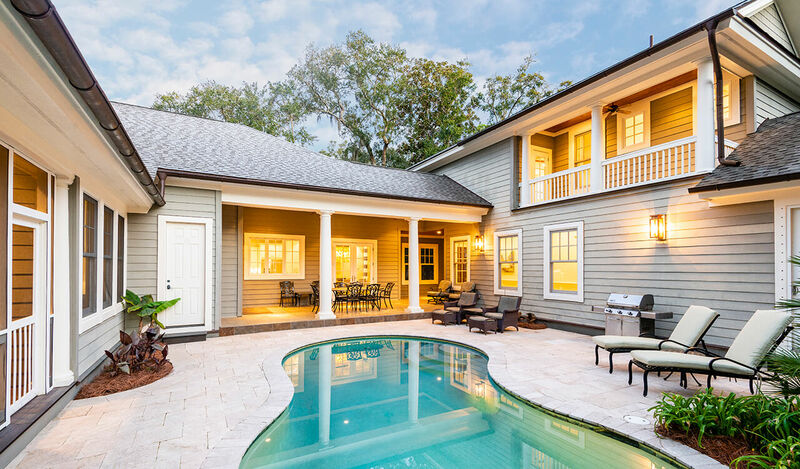 Built in 2006 and renovated in 2019, this immaculate home has an expansive footprint along with 700 square feet of porch space and 2,000 square feet of deck space—including a beautifully hardscaped pool deck in a central courtyard with an in-ground, heated saltwater pool and an outdoor shower. 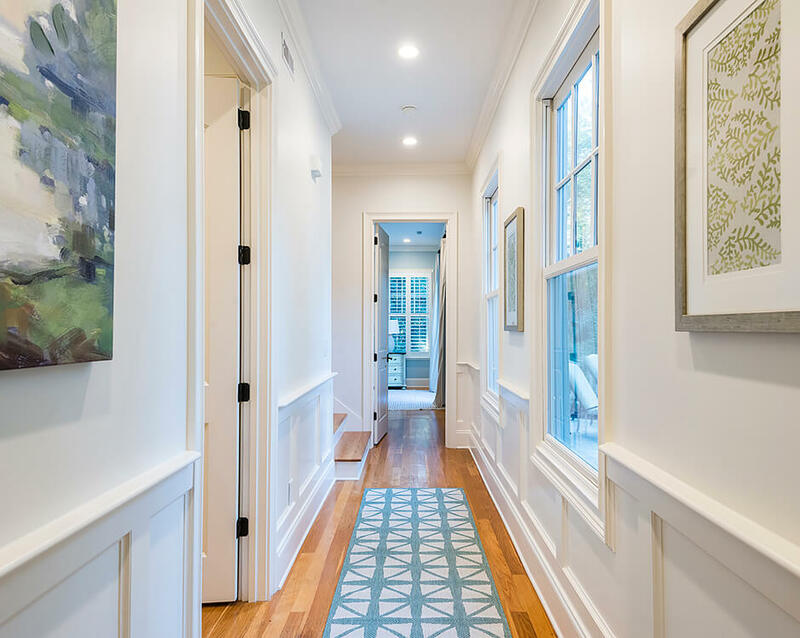 Beautifully designed inside and out, the furnished home welcomes guests with a wide front porch and a gorgeous windowed entry door with skylights. 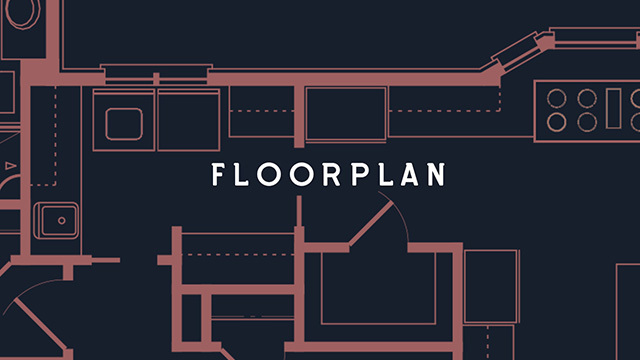 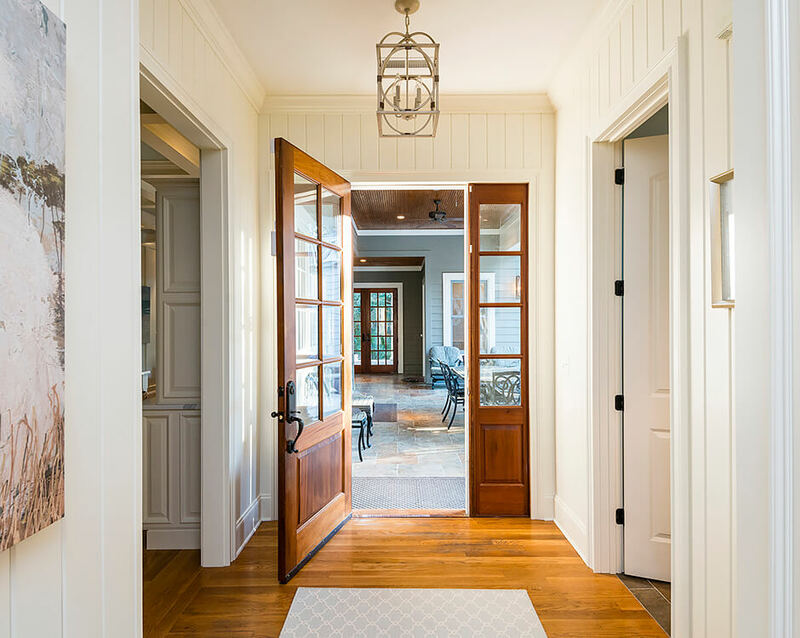 The hardwood flooring of the foyer continues into the great room, where a light-filled living room opens to the left. 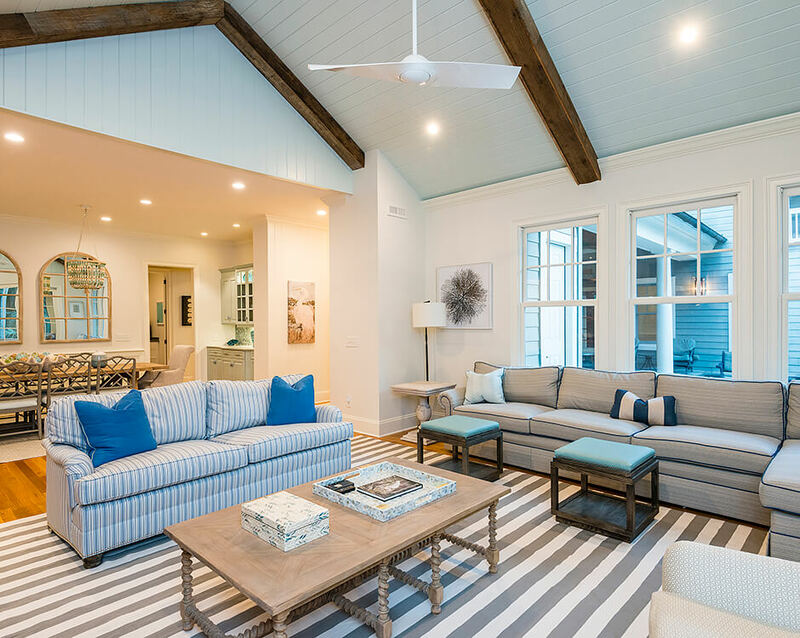 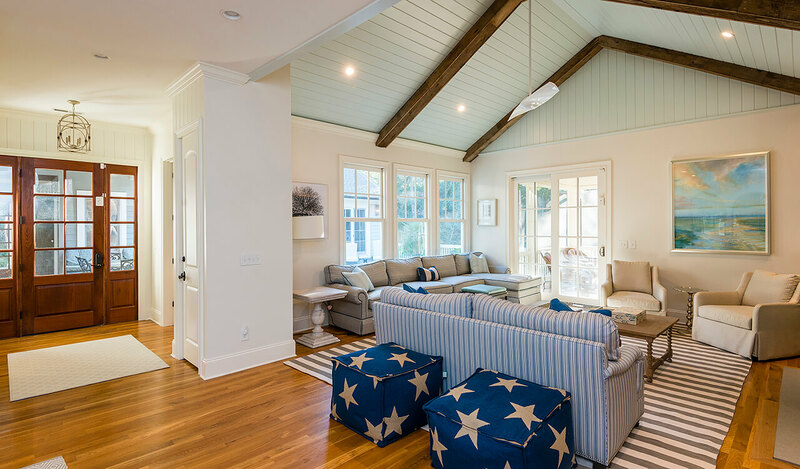 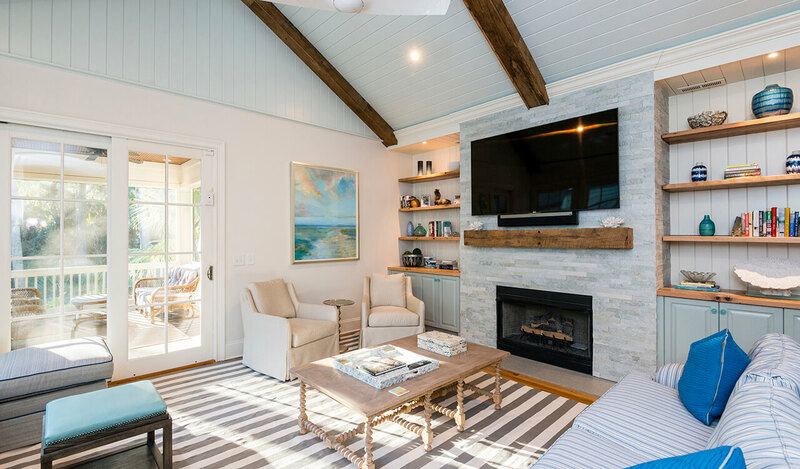 Its dramatic vaulted ceiling of pale blue shiplap accented by dark wooden beams combines with a floor-to-ceiling fireplace with a simple, modern mantel of rough-hewn wood to make the space a showpiece of the home, and French doors lead to a screened porch with a high wooden ceiling. 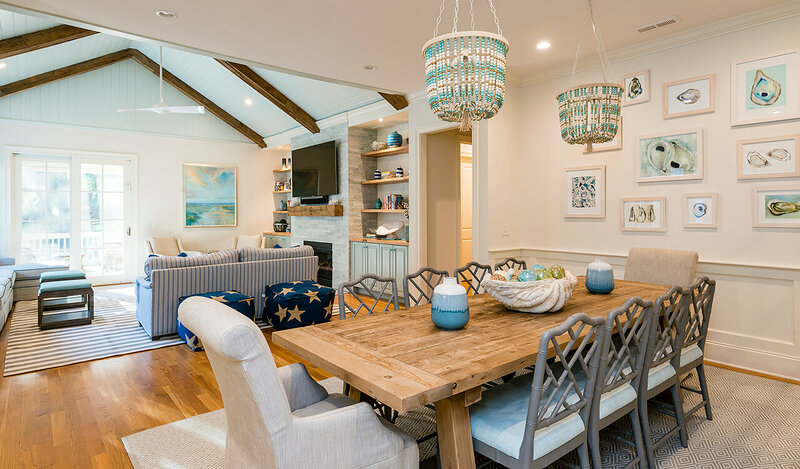 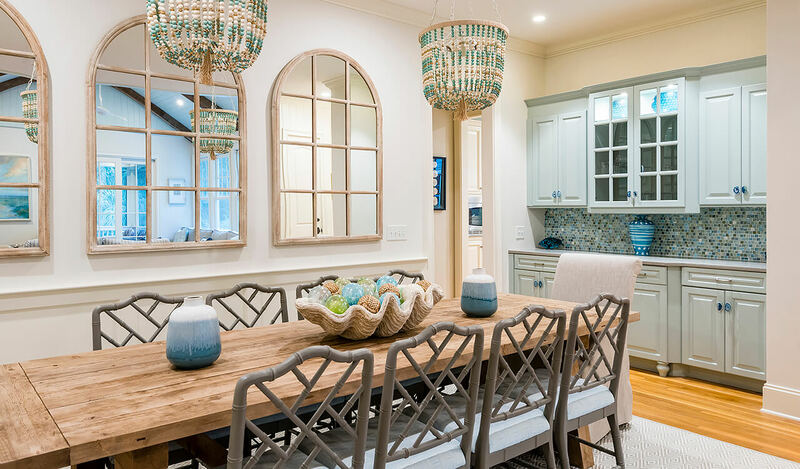 The living room opens into a dining room with lovely white trim and wainscoting, twin chandeliers, a serving bar, salvaged wood beam table, and more than enough space to comfortably seat ten. 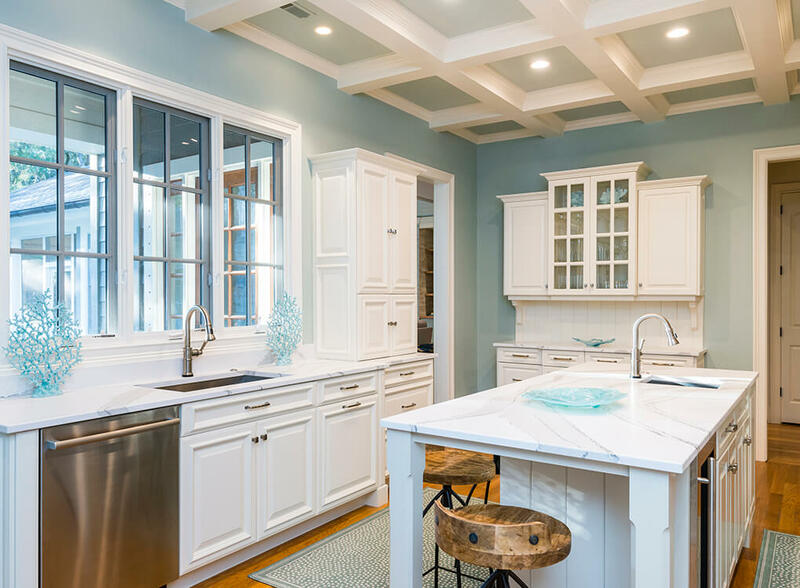 The home’s kitchen is stunning with a coffered ceiling, pale honed quartz countertops, beautifully veined backsplash, center island with prep sink, large windows over a single-basin sink, and plentiful cabinet and pantry space. 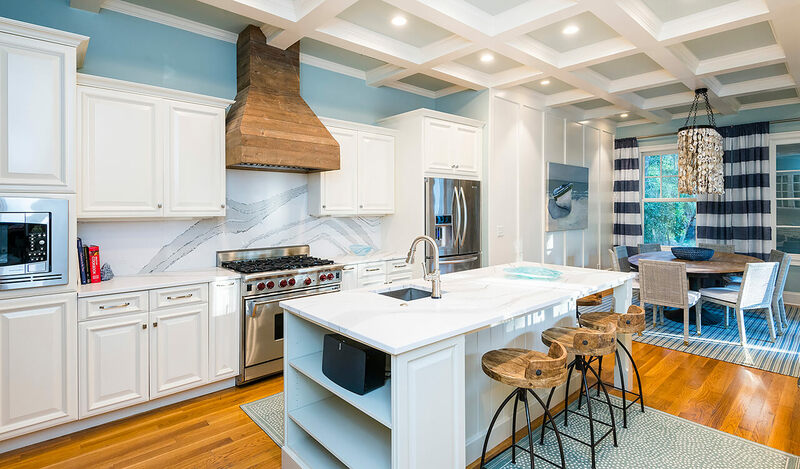 The stove hood is a work of art, and the stainless-steel, professional-grade appliances include a Wolf® gas cooktop, convection oven, Bosch® dishwasher, U-Line Beverage Center and bottom-freezer KitchenAid® refrigerator. 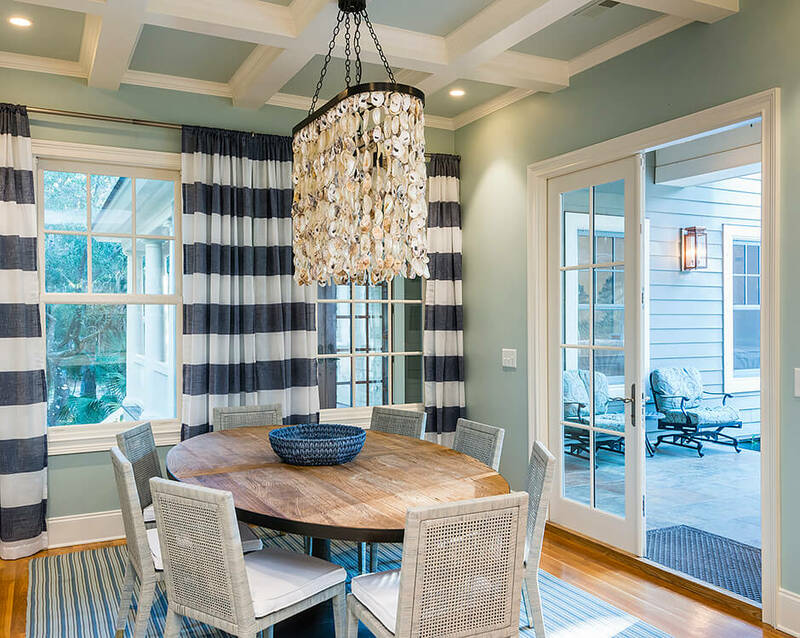 A breakfast nook with tall windows and a dramatic cascading chandelier opens to a covered porch beside the pool deck. 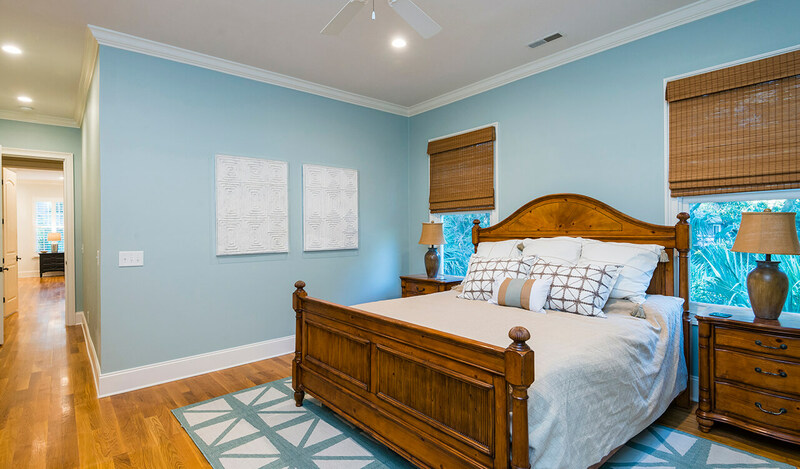 A generously sized game room offers space for lounging and leisure, a study invites quiet relaxation, and the five bedrooms are spacious and bright with natural light. 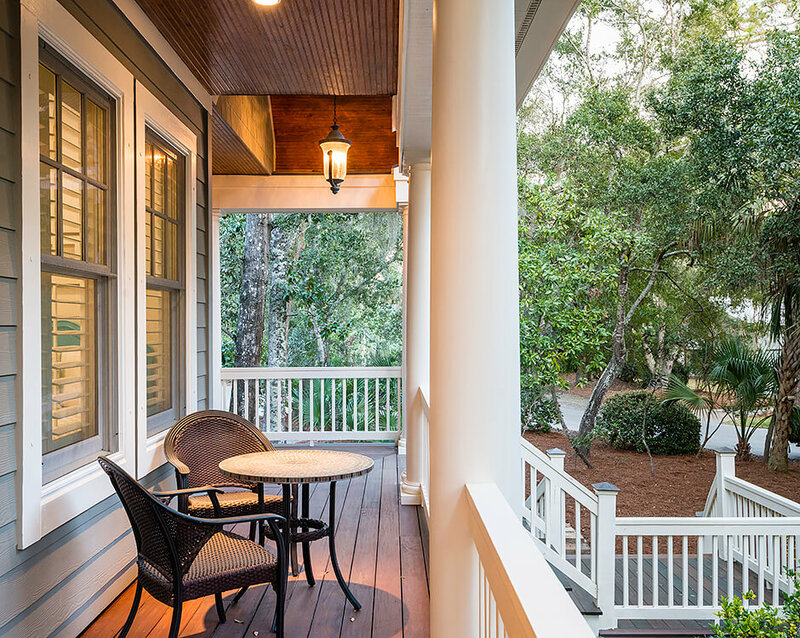 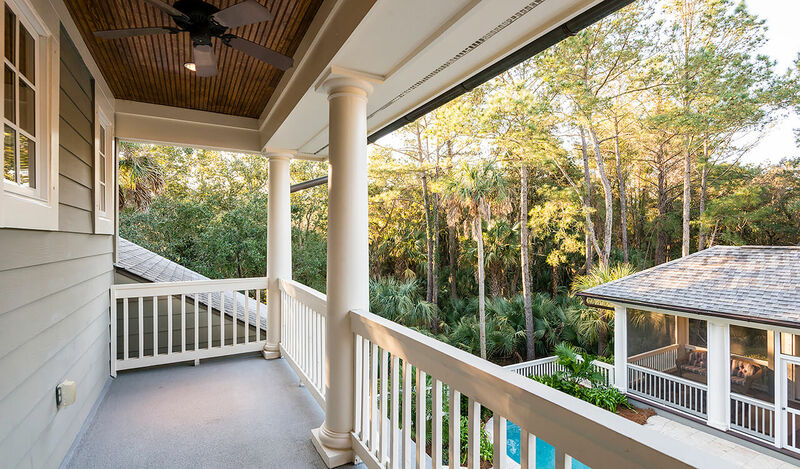 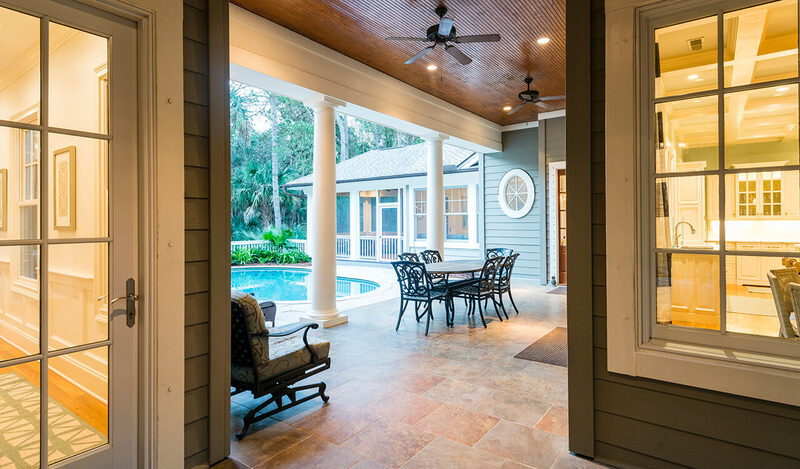 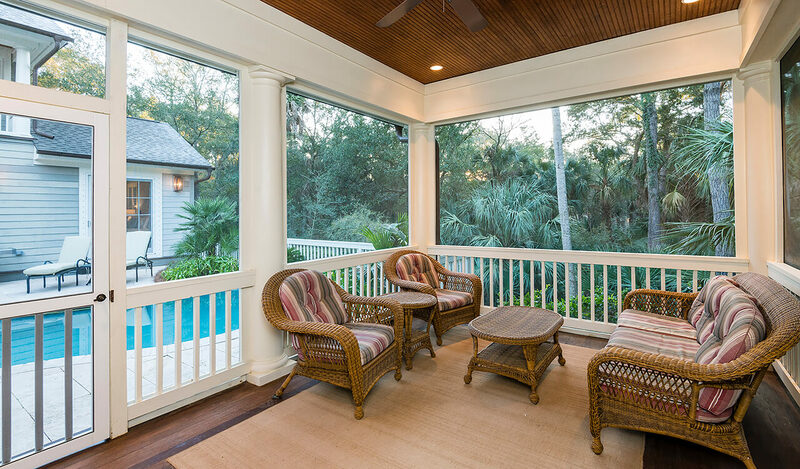 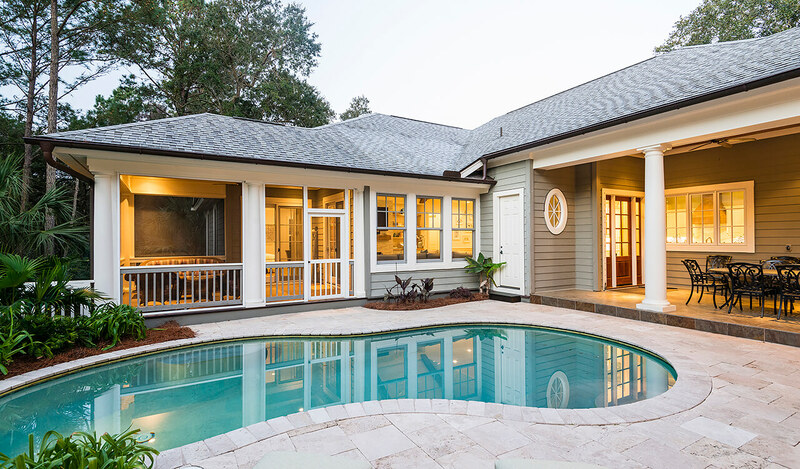 A covered second-story porch overlooks the pool and Kiawah’s lush maritime foliage. 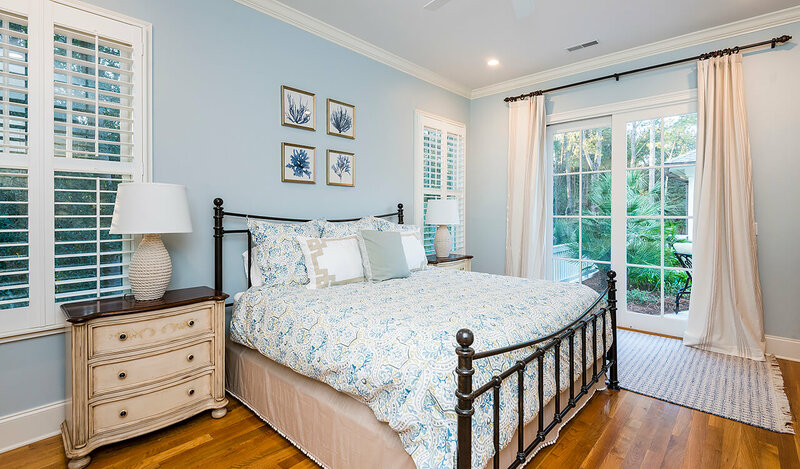 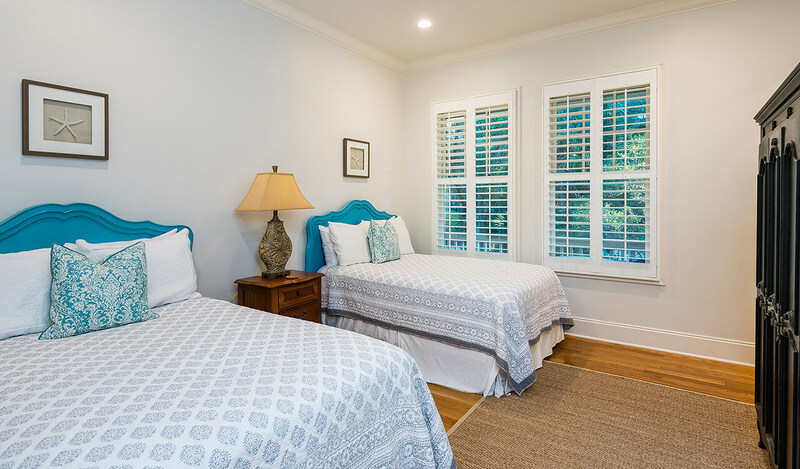 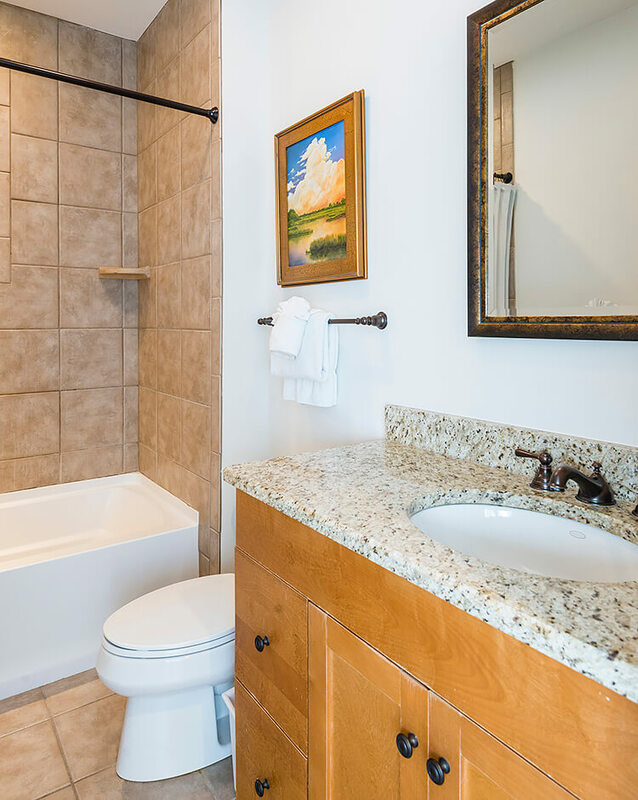 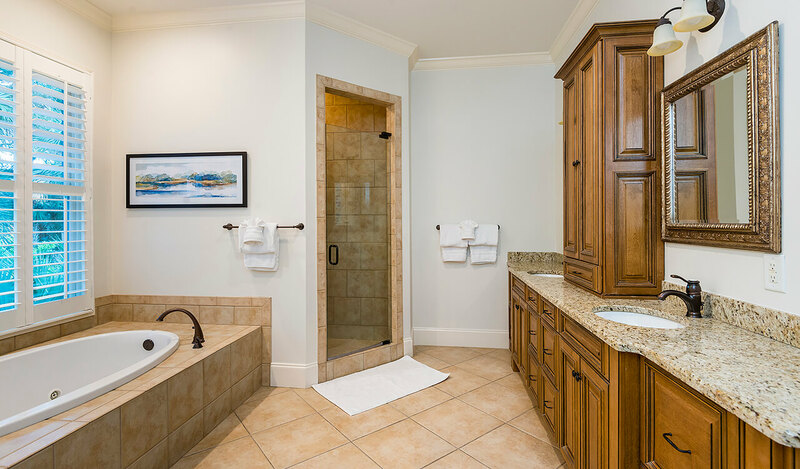 Additional features of this exquisite home include a guesthouse with custom bunk beds, impact-rated doors, sound and security systems, irrigation, a Trane® HVAC new in 2017, and outstanding rental potential.